I have been making all one-pagers lately, which is a pain in the neck when you want to put the LO's into albums. I don't mind if the LO is not a double one, but I hate it when the pages totally clash because I haven't planned it properly. Sometimes (in extreme cases) I prefer to leave the page next to a LO empty and put some nice matching patterned paper next to it, rather than having a clashing LO. I have found that it's easier to match things if I work on pages that go next to each other consecutively, or not very far in time from each other, as I still have the same materials and, especially, I remember what I did in the previous one. So I created this page to go next to the Thomas page I prepared a couple of weeks ago. It is based on Let's Scrap's sketch 3-9-11, which is gorgeous and full of circles, don't miss the chance to scrap that LO. 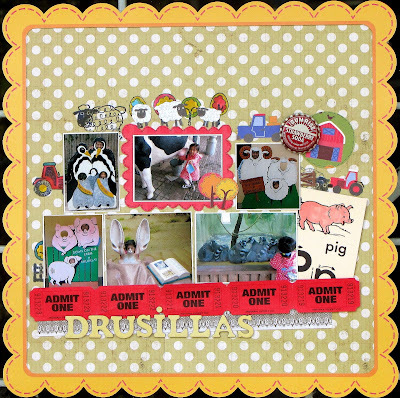 Although Drusillas park is a zoo, most of the pics we took were in the Farm area, so I decided to give it a farm theme (I was dying to try those MLS farm stamps, too!). I was just talking to a friend the other day about the delima of one page layouts not matching. I love the tip on the blank page with cordnaiting paper. It would at least save it if you found something to match. Great idea ! !